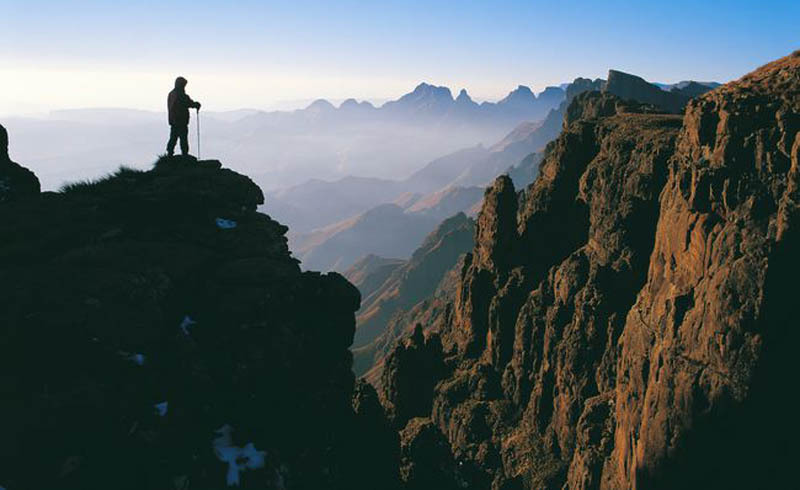 Challenging peaks can be found from Morocco's Atlas Mountains all the way down to South Africa's Drakensberg. 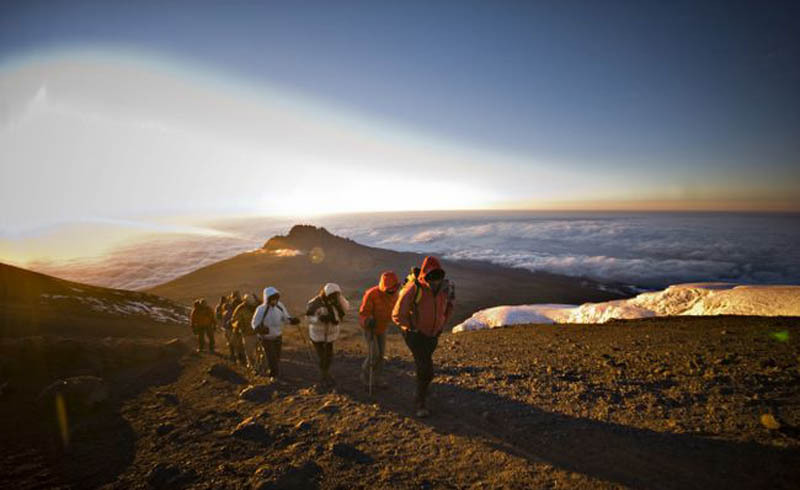 Africa's most popular trekking destination is Mount Kilimanjaro, the highest mountain on the continent. Lesser known ranges like Uganda's Rwenzori Mountains offer an incredible array of snow-capped peaks right next to the equator. Other fantastic hikes in Africa that don't necessarily involve great heights include the Wild Coast (South Africa) and the Fish River Canyon (Namibia). Mount Kilimanjaro is Africa's most popular trekking destination, and at 19,336 feet it's Africa's highest peak. 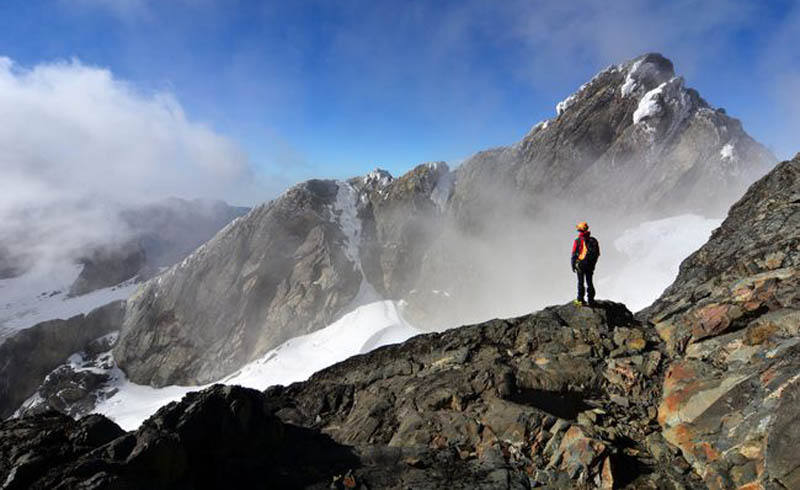 The trek to the summit takes you through 5 different climatic zones. More than 20,000 people attempt the climb every year. Routes vary in degree of difficulty, traffic, and scenic beauty. The least difficult routes are Marangu and Rongai; the more difficult routes are Machame, Shira, and Lemosho. The longer routes have more difficult hiking but you'll be more acclimatized and your chances of reaching the summit are therefore higher. 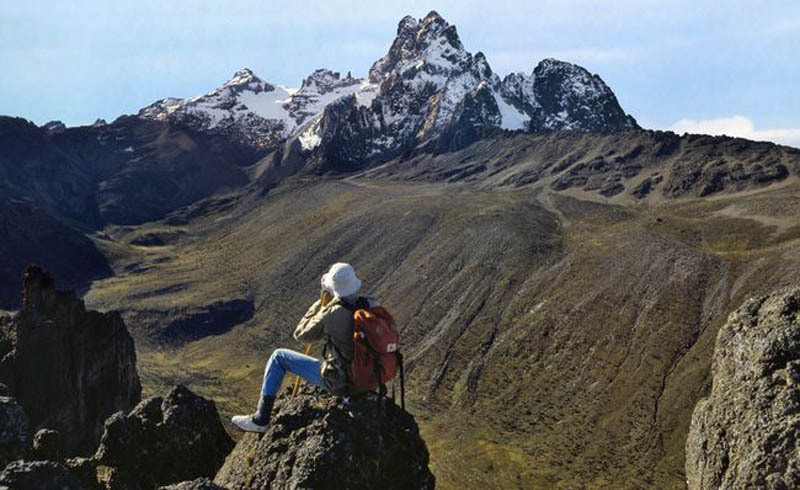 The best time to climb Mount Kenya is between January - February, and July - October. There are huts on the mountain, or you can camp. 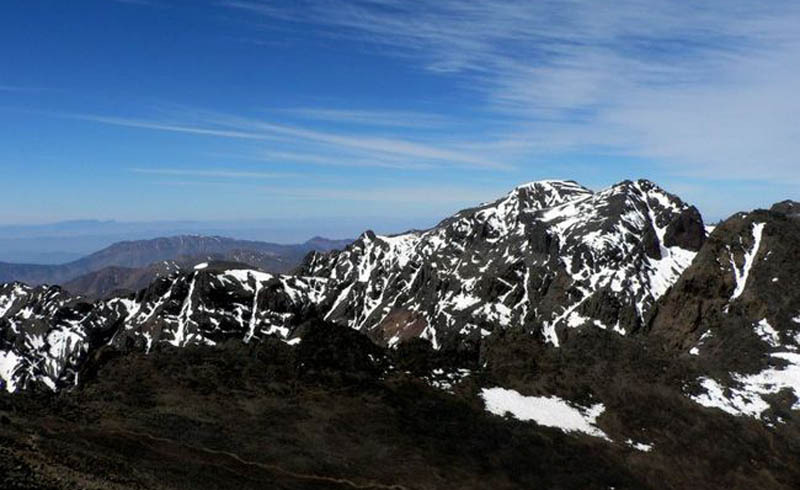 Jebel Toubkal, situated in the High Atlas Mountains is North Africa's highest peak at 4,167m (13,667 ft). It's a challenging trek to the summit, but worth it for the spectacular views. While you can make it to the summit and back to the town of Imlil in a day, it's recommended you take at least 3 days to get the most out of it. Imlil is only about an hour from Marrakech. 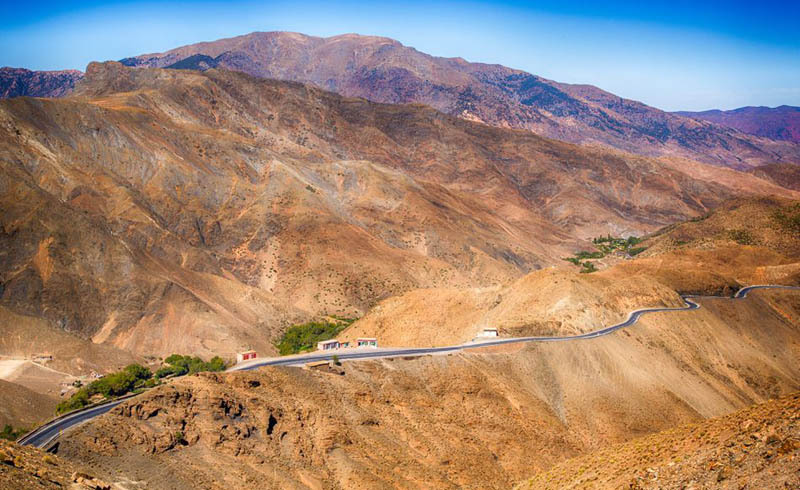 The Atlas Mountains cover a wide territory and there are many good treks available in the Mid, High and Anti Atlas Mountains. All offer a chance to meet with Berber people. The Simien Mountains are a vast mountain range in Ethiopia with many summits above 4,000 meters (13,000 feet). The highest peak is Ras Dashen which stands at 4,543 meters (14,901 feet), making it the fourth highest mountain in Africa. 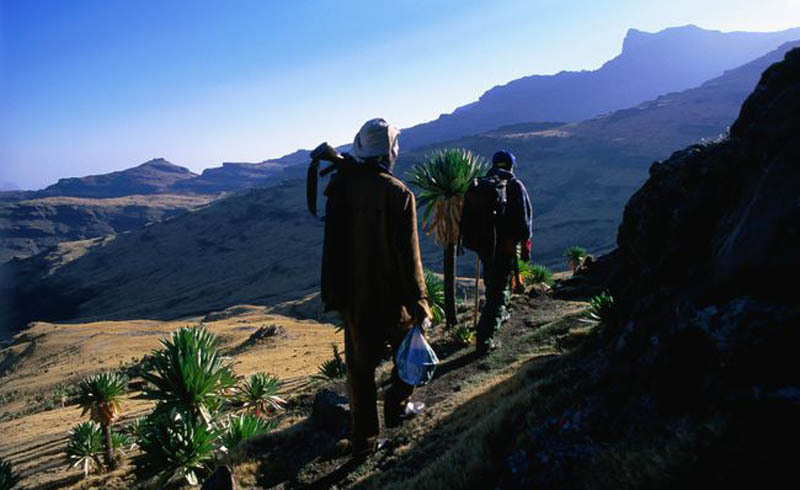 Trekking here is fantastic, not only because of the scenery, gorges, and streams, but also because you get a chance to see some unique, endemic wildlife like the gelada baboon and Walia Ibex. Most treks start from Debark (or Debarek), which is a 3-4 hours drive from Gondar. Equipment, porters, donkeys and more can be arranged from here. The Drakensberg is South Africa's highest mountain range, called uKhahlamba in Zulu meaning "barrier of spears". Its lower elevations are perfect for day hikes, horse riding, San Rock Art viewing and bird watching. Its higher passes offer more challenging treks. 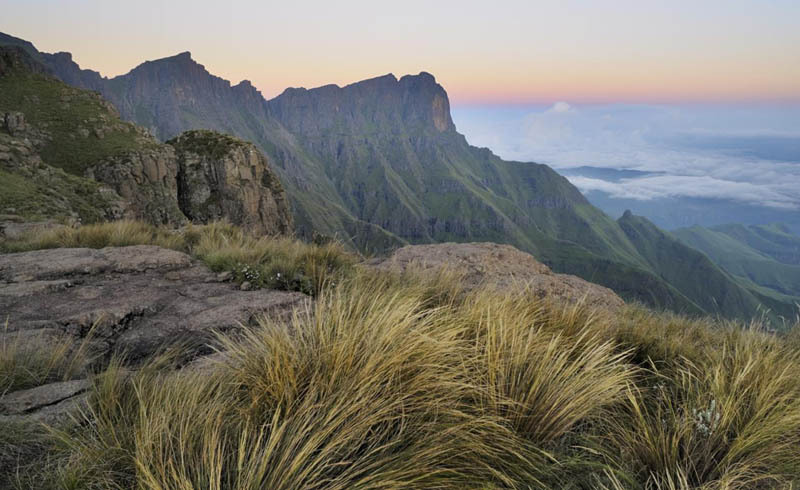 Serious hikers should look into the "Drakensberg Traverse," a 2-3 week hike that encompasses many of the Drakensberg's giant peaks, and dramatic pinnacles, including the Tugela Falls which drop over 3000 feet and tumble over 5 separate tiers. If you don't have that much time, try the spectacular trek from the Sentinel to the Cathedral. Mount Meru is Tanzania's second highest mountain standing at 4,566 metres (14,980 ft). It is often used a practice acclimatization run for its close neighbor, Mount Kilimanjaro. The trek up to the summit of this rather beautiful volcano takes 3-4 days. The route passes through ancient lush rain forests of fig trees, giving way to heather and rocky moors. Along the ​the trail, buffaloes, baboons and giraffes are commonly sighted as well as hundreds of species of birds. The best time to go up is August - October. Hikers spend the nights in small well-tended huts along the route. An armed ranger is compulsory so it's best to organize your trip in advance. 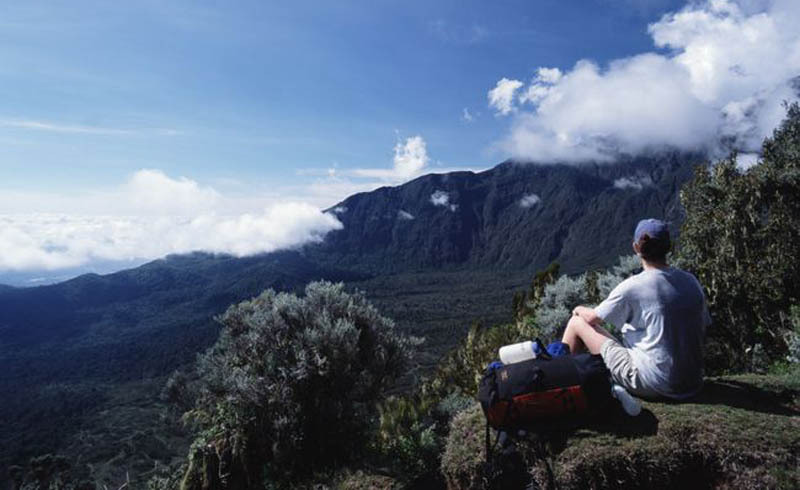 The Rwenzori Mountains (Mountains of the Moon) lie just north of the Equator along the border of the Democratic Republic of Congo (DRC) and Uganda. Mount Stanley is the highest mountain in the range, with twin summits each standing over 5,000m high making it Africa's 3rd tallest mountain. Permanent glaciers adorn the peaks. The main trail up Mount Stanley's peaks is called the Central Circuit and takes 4-10 days. 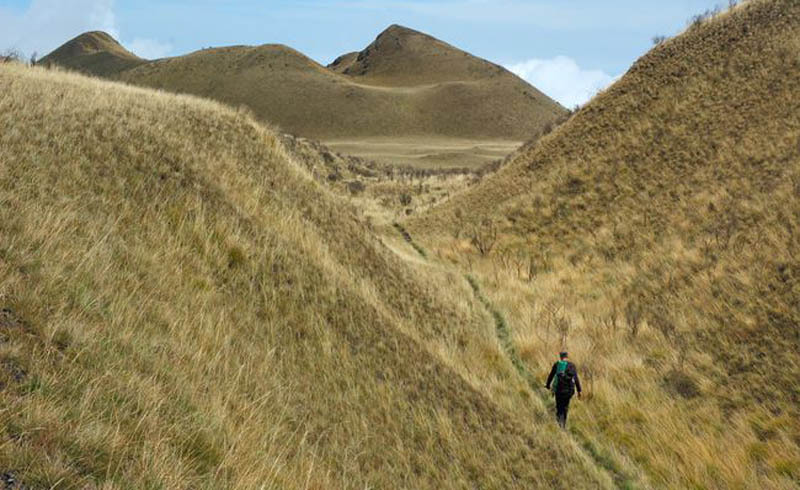 Along the route, you'll encounter thick forest, bogs, boulders, glaciers and elephants. Guides and armed rangers are compulsory. There are basic huts along the routes. Best time to trek is December - February and June - August. 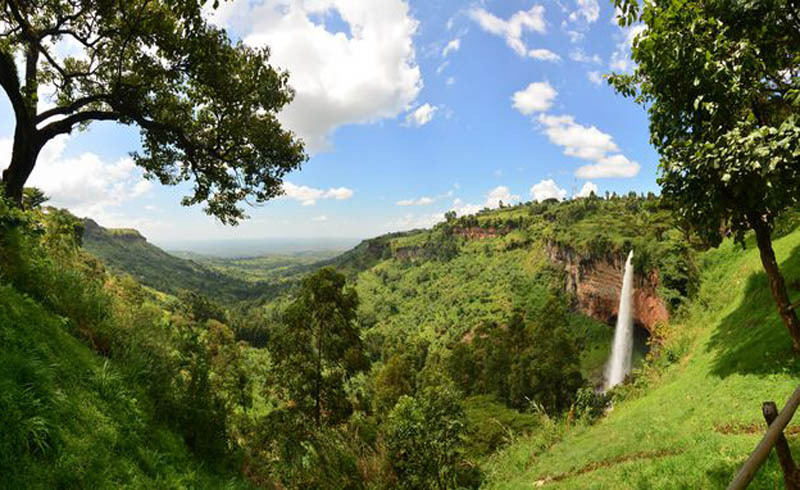 Mount Elgon is a huge extinct volcano that straddles the border between Kenya and Uganda. There are 5 major peaks, the two highest are Wagagai (4,321m) in Uganda and Sudek (4,302m) in Kenya. The caldera is one of the largest in the world. The routes offer challenging hikes along gorges, waterfalls, and caves. December - March is the best time to hike. You must hire an official guide. In Uganda, check in at Mbale for equipment, information and trekking permits. There are several routes to choose from, if you're planning to reach the summit of any of the highest peaks, you'll want to spend at least 5 days on the mountain. Mount Cameroon locally known as Mongo ma Ndemi ("Mountain of Greatness") is West Africa's highest peak, standing at 4,040 meters (13,255 ft). Mount Cameroon is an active volcano, the last eruption took place in 2000. There are several trails on the mountain. The oldest and steepest trail is the Guinness Trail named after an annual marathon race that used to be sponsored by Guinness Beer. Porters and guides are compulsory on this 2-3 day trek. Basic huts and camps can be found on the main trails. The main route passes through farmland, rainforest, montane forests, savanna and, finally, reaches the rocky summit. The Mountain Club of Malawi has good route information as well as information on fees and how to pay your porters. If you join the Mountain Club you can use their cooking facilities stored in the huts. 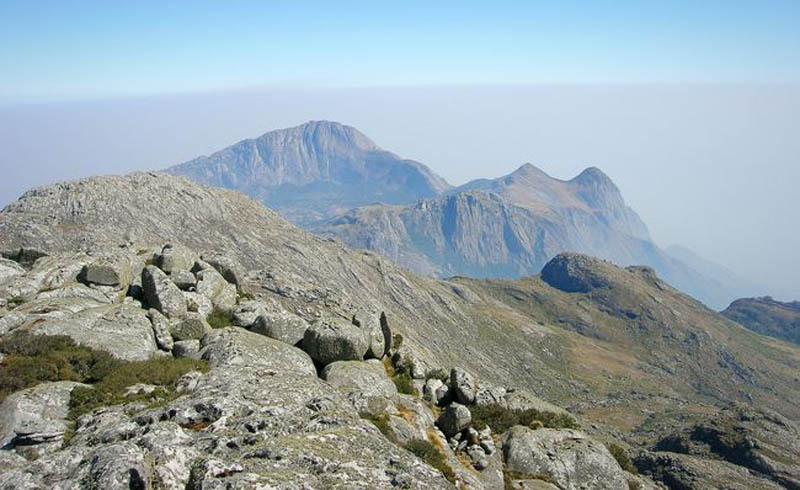 Start your hike from the Lihkubula Forest Lodge.The best time to climb Mulanje is between May and October.